"Age of (the male demon) Kali", or "age of vice") is the last of the four stages that the world goes through as part of the cycle of yugas described in the Indian scriptures. The other ages are Satya Yuga, Treta Yuga and Dvapara Yuga. It is the latter Age in which we now live, and which we account for in our histories. It is also believed by some, that the Kali Yuga is now ending -- or even that it has ended and we are now in a transition period called the "Twilight of the Kali Yuga." Some believe that it is now near the beginning of Dvapara Yuga. The Kali Yuga is referred to as the Dark Age because in it people are as far removed as possible from God. Take for instance the age we are living in. It is a dark age because there is war, famine, disease, hate, and religious disunity. The age of Dwapara can be characterized by a breakdown of the idea of a material world and a growing consciousness of the underlying unity of peoples, energy and nature. The cycles are said to repeat like the seasons, waxing and waning within a greater time-cycle of the creation and destruction of the universe. Like Summer, Spring, Winter and Autumn, each yuga involves stages or gradual changes which the earth and the consciousness of mankind goes through as a whole. 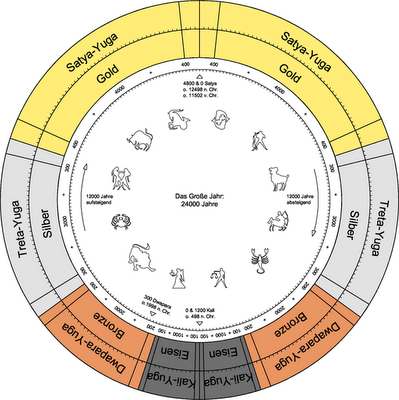 A complete yuga cycle from a high Golden Age of enlightenment to a Dark Age and back again is said to be caused by the solar system's motion around a central sun. The final avatara comes at the end of Kali Yuga to destroy all things and prepare the way for the next Yuga. There are, therefore, many appearances of Rama, Krishna, and the other avataras. This is all takes place within the great cycles of yuga time. In Hinduism, Kalki is the tenth and final Maha Avatar (great incarnation) of Vishnu who will come to end the present age of darkness and destruction known as Kali Yuga. The name Kalki is often a metaphor for eternity or time. The origins of the name probably lie in the Sanskrit word "kalka" which refers to mud, dirt, filth, or foulness and hence denotes the "destroyer of foulness," "destroyer of confusion," "destroyer of darkness," or "annihilator of ignorance." Other similar and divergent interpretations based on varying etymological derivations from Sanskrit - including one simply meaning "White Horse" - have been made. 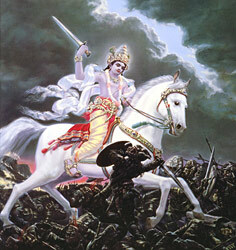 Below is a picture of Lord Kalki on a White Horse. In the Book of Revelation, Christ rides a white horse out of heaven at the head of the armies of heaven to judge and make war upon the earth. According to Jewish tradition the Messiah will appear ridding a donkey, although the color is unspecified in the original source Zechariah 9:9, which states "your king is coming to you; righteous and having salvation is he, humble and mounted on a donkey, on a colt, the foal of a donkey," popular perception places the color of this donkey as white. In Islam, some believers say the redeemer Mahdi will arrive riding a white horse. A huge white horse appears in Korean mythology in the story of the kingdom of Silla. When the people gathered to pray for a king, the horse emerged from a bolt of lightning, bowing to a shining egg. After the horse flew back to heaven, the egg opened and the boy Park Hyeokgeose emerged. When he grew up, he united six warring states. 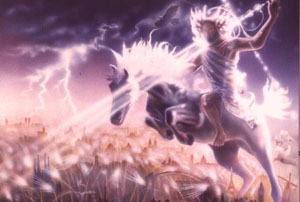 Many religions depict this one coming Messiah to end the present age of darkness is riding a white horse. Many of you may have heard about a man named Nostradamus and that he has wrote future prophecies. Please keep in mind that Nostradamus writes in riddles. Doing research on the internet, I have noticed many people deciphering his code for the end of ages. What do rockets leave trails of? Fire and sparks. And at The Rocket to Luna homepage, you will be seeing in the sky, a great fire dragging with sparks! Amazing, isn't it? Can this comet he is referring to also be a rocket? As I was reading Nostradamus, I noticed that a lot is similar to what is in The Book of Revelation. Is the King of Terror Nostradamus writing about Christ's return from the sky? "He will bring to life the King of The Mongols." Mongol people includes all people who speak a Mongolic language, such as the Kalmyks of eastern Europe. The Holy Warrior of the Mongols was Genghis Khan. "Khan" means the king. In the script, The Legend of Luna, There will be many Kings coming to life, such as Genghis Khan. "Mars reigns happily." Is Nostradamus speaking of the planet Mars or the Roman god of war? If in this context, he is referring to the Roman god of war, then the Roman god of war Mars reigns happily, because the war is won and peace is established on Earth. 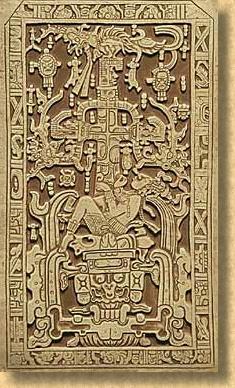 The carving is a picture of a man seated at the controls of a type of flying ship. His hands and feet appear to be working instruments and pedals. The outline of the craft can be seen with many mechanical features and what appears to be flames coming out of the bottom of the craft. Stay tuned for my upcoming blog entries as I will be going into more depth about the cosmos, spirituality, and war. As I got home, I sent an instant message to a friend of mine on AIM (AOL Instant Messenger) and noticed he was using the sticker as his chat icon. I then asked him what this means, and he gave me the URL to a site titled OBEY Giant. "Interesting," I said to myself. This seems to be a very good strategy - the stickers. I later noticed a girl at my workplace had an OBEY Giant poster in her office. If you do not know about OBEY Giant, The OBEY sticker campaign can be explained as an experiment in Phenomenology. You may find out more about it here. I thought this was a great idea, and since the Eyes of Horus represent protection against evil, I thought The Rocket to Luna Eyes of Horus (Udjat) sticker campaign would also be a great idea. Horus, the son of Osiris and Isis, was called "Horus who rules with two eyes." His right eye was white and represented the sun; his left eye was black and represented the moon. According to Egyptian legend Horus lost his left eye during a fight with his murderous uncle, Seth, to revenge his father's death. Seth tore out his nephew's eye but lost the fight because the assembly of the gods declared Horus the victor. The eye was reassembled by the magic of Thoth. Then Horus gave the eye to Osiris who experienced rebirth in the underworld. In the Ancient Egyptian measurement system, the Eye Of Horus was used a form of fractional notation, each of the parts of the eye representing a different fraction. There are six parts. When Horus has lost his left eye, it was torn into six pieces, and later reassembled by Thoth. Now that I explained about the Eyes of Horus in the Egyptian context, let me explain to you how this ties into Christianity and the coming of the second Messiah, Judah. Horus' right eye was associated with the sun Ra. So then who is the Second Coming of the promised Messiah. If Jesus represents the right eye, then would not the left eye represent the second Messiah, and that his life would be very similar to that of Thoth's, who was a moon god. And that this Messiah would reassemble the left eye that was lost and establish God's Kingdom on Earth as a world of peace and harmony. Osiris was the father of Horus. "And Jesus said, Father, let them have forgiveness, for they have no knowledge of what they are doing. And they made division of his clothing among them by the decision of chance." In the script I am working on, The Legend of Luna, Judah is a high priest who reassembles the missing pieces and returns it to the Father, who experiences rebirth and establishes His Kingdom on Earth, as a world of peace and perfect harmony, much like the Osirian Legend. Below are the reassembled six pieces (the seven seals:) It is the star of David, with six symbols on each point of the star. Credits - The Greatest Sign: Mission Of Maitreya, "Eternal Divine Path"
Stay tuned for my next blog entry, as I will be going into more detail. If you have any questions, please do not hesitate to contact me or post in the world discussion board. Monday I am distributing this press release article to more news release distribution services. As you can see on the front page, the cost of war in the U.S. keeps increasing as of 2001. You can see the cost of war at your community by clicking on the link underneath the cost of war counter and the four horsemen of the apocalypse at the front page. In the Book of Revelation, Jesus Christ opens the first four of the seven seals, which summons forth the four beasts that ride on white, red, black, and pale-green horses symbolizing conquest, war, famine, and death, respectively. The Christian apocalyptic vision is that the four horsemen are to set a divine apocalypse upon the world as harbingers of the Last Judgment. Most of you may know that we are in a time of recession and there is a famine in the world this very moment. The cost of war keeps escalating and the fourth horseman of the apocalypse represents death. The goal of The Rocket to Luna is to end world famine and establish a world of peace, before it's too late. I can now only leave the choice to the people. Like in the film The Matrix, you have a choice. You take the red pill, you stay in wonderland and I show you how deep the rabbit hole goes, or you can take the blue pill and the story ends and you can believe whatever you want to believe. Remember, all I am offering is The Truth, nothing more. I have also added Share links at the front page. You may now share The Rocket to Luna website on websites such as Facebook, MySpace, and Twitter. My current status is to earn funds to build the lunar rover. If you are a website owner and looking for a great way to promote your website, you may do so at The Five Million Dollar Rumble. A live game show is coming up in a future round. In the meantime, I am going to do the best I can without funding. Wernher von Braun was a man of genius. He was a German-American rocket scientist, astronautics engineer and space architect, becoming one of the leading figures in the development of rocket technology in Germany and the United States. He was said to be the preeminent rocket engineer of the 20th century. His dream to help mankind set foot on the Moon became a reality on July 16, 1969 when a Marshall-developed Saturn V rocket launched the crew of Apollo 11 on its historic eight-day mission. "In this age of space flight, when we use the modern tools of science to advance into new regions of human activity, the Bible ... this grandiose, stirring history of the gradual revelation and unfolding of the moral law ... remains in every way an up-to-date book. Our knowledge and use of the laws of nature that enable us to fly to the Moon also enable us to destroy our home planet with the atom bomb. Science itself does not address the question whether we should use the power at our disposal for good or for evil. The guidelines of what we ought to do are furnished in the moral law of God. It is no longer enough that we pray that God may be with us on our side. We must learn again that we may be on God's side. " ~ Wernher von Braun. "We must learn again that we may be on God's side." Learn again, we must. And to learn again, we must unlearn, and relearn. Growing up as a Roman Catholic, I would ask elders many questions, such as "What is the true religion?" One elder man told me it was his religion, which was Christianity, and that any other religion is false. I did not agree with this. I did not agree with many teachings by nuns and priests of Christianity growing up. A lot of the teachings did not make logical sense to me, even as a young child. I started questioning everything, and a lot of the answers were false. I then knew something was wrong with religion. What bothers me the most is that there are "religious" groups that hate on other "religious" groups. The true message of religion is love, peace and unity -- not hate. How did this disunity come to be? The answer is tyranny. The aim for a tyrant is money, power, and slaves. And in order to get slaves, there has to be some sort of lie people will believe to justify slavery, and that lie can pertain to religion. On 1 September 1939, Adolf Hitler and the Nazis faked a Polish attack on a minor German radio station in order to justify a German invasion of Poland. An hour later Hitler declared war on Poland stating one of his reasons for the invasion was because of "the attack by regular Polish troops on the Gleiwitz transmitter." France and Britain had a defensive pact with Poland. This forced France and Britain to declare war on Germany, which they did on September 3. What started World War II was a big lie, and ended in humiliation. The song (Sabaton - 40-1) is about the Battle of Wizna, which lasted from September 7 until September 10, 1939 during which Captain Wladyslaw Raginis and his 720 soldiers defended Wizna (Poland) against an estimated 42,200 Germans (Nazis) (which in fact, would be 59:1). The song praises the bravery and heroism of the Polish army. The Polish were just like the Spartans who fought against the tyrant Xerxes and the Persian army, and were outnumbered by far. The Polish had only two anti-tank rifles that destroyed ten tanks and a few armored cars. 720 Polish soldiers fought for three days against 42,000 Nazi Germans, 350 tanks, 657 guns, mortars, and howitzers, as well as aerial support. Several dozen of Polish soldiers got to captivity and the rest have fallen in battle. The earliest mention of tyranny in the bible is the story of The Tower of Babel. Nimrod is a Mesopotamian monarch mentioned in the Book of Genesis. He is depicted in the Bible as a mighty ruler and nation builder who founded many cities, including the great Babel or Babylon. Despite his stance as a powerful leader, his reputation was tarnished by his traditional association with the construction of the Tower of Babel. Several ruins preserve Nimrod's name, and he is featured in the midrash. In some versions of scriptures, he proclaims himself a god and is worshipped as such by his subjects, sometimes with his consort Semiramis worshipped as a goddess at his side. He also gradually changed the government into tyranny, seeing no other way of turning men from the fear of God, but to bring them into a constant dependence on his power. Those men who put themselves under Nimrod's dominion became slaves. "And the whole earth was of one language, and of one speech. 2 And it came to pass, as they journeyed from the east, that they found a plain in the land of Shinar; and they dwelt there. 3 And they said one to another, Go to, let us make brick, and burn them thoroughly. And they had brick for stone, and slime had they for mortar. 4 And they said, Go to, let us build us a city and a tower, whose top may reach unto heaven; and let us make us a name, lest we be scattered abroad upon the face of the whole earth. 5 And the Lord came down to see the city and the tower, which the children built. 6 And the Lord said, Behold, the people is one, and they have all one language; and this they begin to do; and now nothing will be restrained from them, which they have imagined to do. 7 Go to, let us go down, and there confound their language, that they may not understand one another's speech. 8 So the Lord scattered them abroad from thence upon the face of all the earth: and they left off to build the city. 9 Therefore is the name of it called Babel; because the Lord did there confound the language of all the earth: and from thence did the Lord scatter them abroad upon the face of all the earth." Does this literally mean the Lord came down from heaven? The Bible does not mention any meeting between Nimrod and Abraham, but later Jewish tradition brings the two of them together in a cataclysmic collision, a potent symbol of the cosmic confrontation between Good and Evil, and specifically of monotheism against paganism and idolatry. "and this is what they begin to do." What they begin to do is put themselves under Nimrod's dominion and become slaves. Abraham was a man of God. Nimrod was in rebellion to God (his name comes from the Hebrew verb marad, meaning "rebel."). Through Abraham, God has babeled "confused" the people. How can there be two Gods? The people of Nimrod are now confused, because they believed a lie and swallowed it as The Truth, and now here comes Abraham (The Good) vs. Nimrod and his people (The Evil.) And why did the people scatter? Was it because they were humiliated and their arrogance and pride has caused them to scatter, causing them to speak in different tongues, causing disunity. The corollary is: The masses will accept any lie and accept it as The Truth if it is spoken with vigor, energy and dedication. The Legend of Luna will be a work pertaining to what I just wrote. Judah vs. Narcaster and his evil new world Order. Judah is the man and son of God who will be battling Narcaster, Jezebel, and his evil empire to save mankind from their ignorance, slavery, and worship of idolatry (money). Tomorrow a press article is being released in regards to this site, The Rocket to Luna. Posted by Gregory Rzeczko @ 3:30 AM EST.